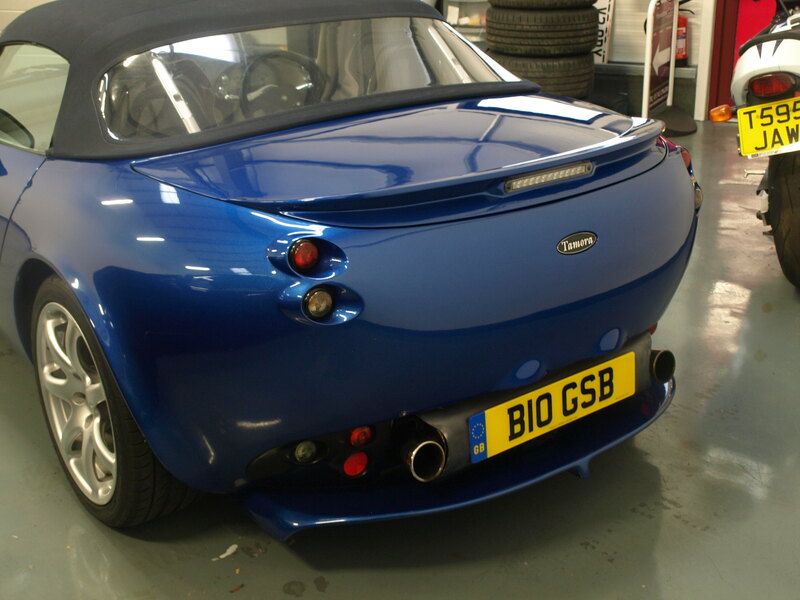 TVR back – faulty plug? On Friday I had a call from Jason at TVR Power to say the car was fixed. He had connected it to the computer, which said it was ‘running like a donkey’, with multiple faults. The spark plugs were checked, and the plug for cylinder 6 was heavily fouled with fuel and not sparking at all. The HT leads and coil were checked and these were found to be fine, so they weren’t the cause. Throttle balance for 6 was slightly out and was corrected. But not sufficiently out to have caused such an issue. And they were all balanced just 600 miles ago at the 12k service. With a new plug the car was tested and found to be running fine. The cost for this was £0, which is nice. I picked it up early on Saturday and drove the hour home and it ran fine. It is always a bit tricky when you are listening / feeling for any hint of a problem, but I didn’t notice anything. The bad running, noises, and excessive hear from the exhaust would have been caused by this misfire and the subsequent dumping of fuel into the exhaust. The unburnt fuel burning in the catalytic converter explains the heat and could have damaged it. I don’t recall feeling or hearing any issues at 130 mph, but the wind noise was loud and the suspension was working hard on the Millbrook surface. It was definitely off when I left the bowl after slowing down gradually and I think it then got worse over the next few miles. 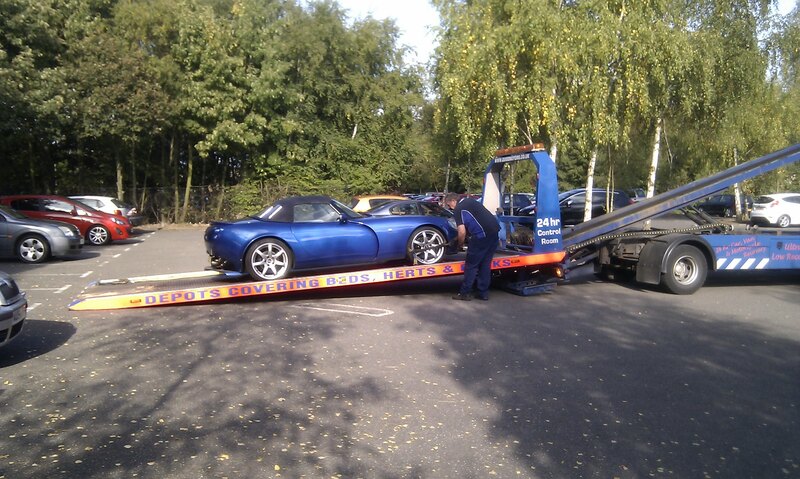 Given how well the car is running now, Jason thinks that a faulty plug could be the culprit. It was supposed to be a 2-person training day for us, but our baby became unwell so my wife ended up staying at home. This is the Performance Driving Day with CAT Driver Training, who are the only driver training company with a base at Millbrook, and have an extremely good reputation. 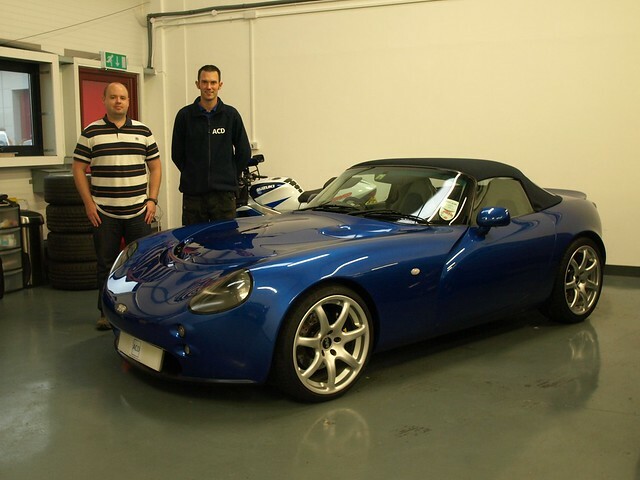 To learn how to drive the car well and smoothly with 1 to 1 tuition and on lots of varied tracks and surfaces rather than an airfield or a trackday shared with many other cars. 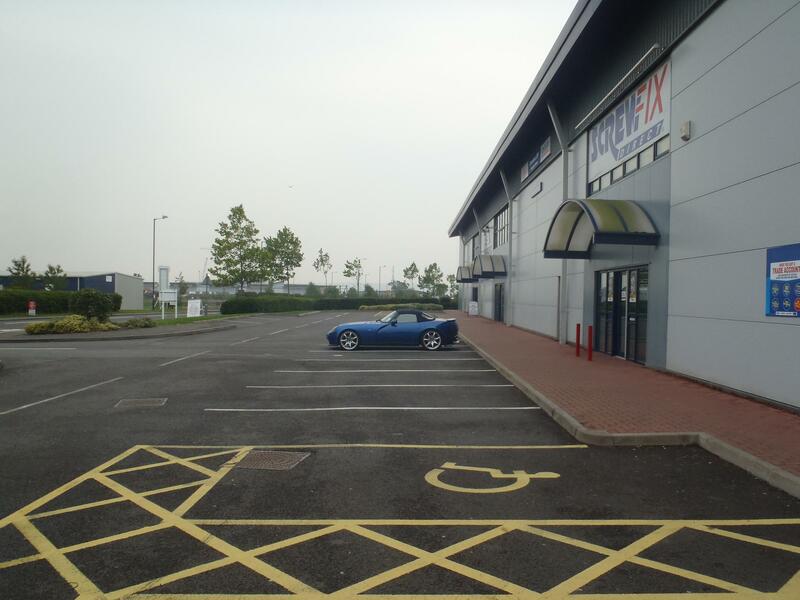 We had been to CAT driver training before – In February 2012. This day was cut short in when, in the first session on threshold braking, we found the car had heavily rear-biased brakes. Colin kindly let us postpone the training until the car was sorted. This took a long time as I was then working away for a couple of months and we then had a baby. Given we were supposed to be doing a 2-person day, we waited until he was old enough to be left for a long day before re-booking. We have also spent a lot of time trying to sort out the brake bias, suspension and generally getting the car how I want it. With this done, I thought the car was sorted, and had feedback from TVR garages that the bias felt correct when they had test-driven the car. The drive there was fine and fast (leaving home at 6am), and I was pleased that where the Total garage had been in Mareston Moretaine, there is now a Shell station so I got a full tank of V-Power Nitro. I arrived at Millbrook a little early so had sandwiches in the car park (2nd breafast), before meeting Colin. When Colin found out that Naomi was unable to come he immediately offered to rearrange to another date, but he had already done that once for us, so I didn’t want to mess him about and we carried on with the day. We started with a briefing, discussing what I wanted to get out of the day, and then headed out in his BMW to go on some of the tracks that we would be using and for some examples of car handling and work we would be doing later. Lots of interesting cars out at Millbrook, including the new McLaren P1, which was interesting to see driving around. We started the threshold braking on the mile straight, and immediately found the car was still too rear biased. I wound out the bias valve to the limit of its extent (where it rattles), and the bias improved, but it was still borderline and more rear biased than is ideal. We got plenty of heat into the brakes doing braking to a stop from 60 mph and then building up to 90. Colin throught it was a significant improvement on last time, and we could go ahead with the training, but it would benefit from fixing. We then discussed how hard it is to fix something like this without an engineering team at a track. Moving on from brake work we went to the high-speed bowl to start with double lane change in lanes 1 and 2 at speeds from 30 to 40 mph, getting smooth fast steering input but keeping the throttle balanced to avoid accelerating / decelerating while we did so. This went well and the car was behaving. We then went to the 2-mile banked circle for high-speed driving. This started at at 85 mph to see how the car felt, then up to 105 in the outside lane before stopping and having a chat about it. Compliance and bump steer was discussed and the need to let the cat do the work rather than putting in lots of little steering inputs in an attempt to compensate (I wasn’t doing much of this). We went back out and took the car up to 130 mph with me concentrating on relaxing and it went quite well. I think it used all the rear suspension travel at one point and there was a tiny wheel / arch rub. Wind-noise was significant above 100 mph, but the car felt stable even over this quite lumpy surface. Colin was quite happy with the way it handled. On the way back to CAT’s base for a break, I thought the exhaust note had changed (blowing?) and power seemed a bit flat at low revs. When we got there the car was very hot with a bit of smoke rising from the exhaust manifold and a burning smell, but we could see no evidence of fluid leaks. After coffee and a chat about how dissapointing the recurring brake issues were, as well as the change in exhaust noise. Colin kindly made an offer to help with brake testing when I had made progress on the problem, which was very generous. 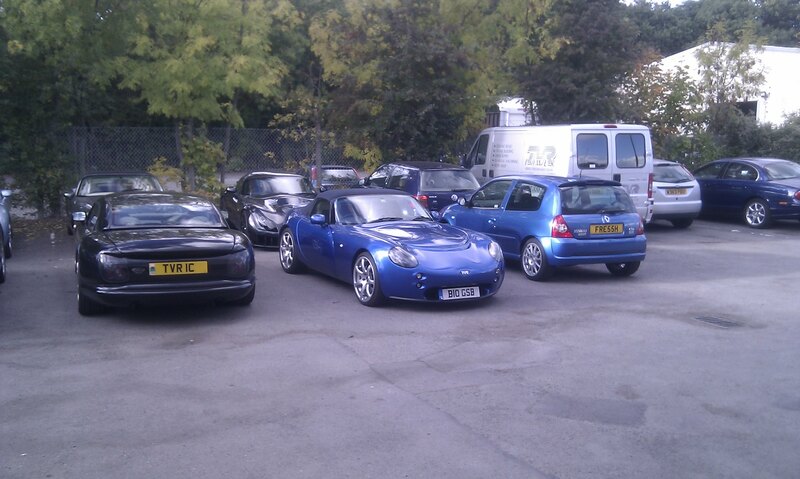 We then headed out to do some heel and toe training. This went ok, but a lot of practice will be needed to get the hang of it. However, the car wasn’t sounding great through the lower part of the rev range, and Colin contacted control to see if we could get garage space to look at the car. They were able to accomodate us, and we had a garage with drive-on 4 post lift. Passing the McLaren P1, an MP4-12C and a few other interesting vehicles on the way. Up on the ramp there was nothing visibly wrong or any leaks. A Millbrook mechanic turned up and helped inspect the car. An exhaust hanger on the rear box was quite cracked and was misssing the circlip that should secure it. The gearbox was very hot, but I believe that is normal due to the position of the cats (alongside it). No blowing was apparent from underneath when the car was running, but with a few revs it didn’t sound right. Colin also thought there was some pinking / knocking at low revs when trying to drive onto the ramp. With the car not sounding right, and the exhaust seeming hotter than it should we headed back to CAT’s base for lunch (which had kindly been collected for us) and called it a day. 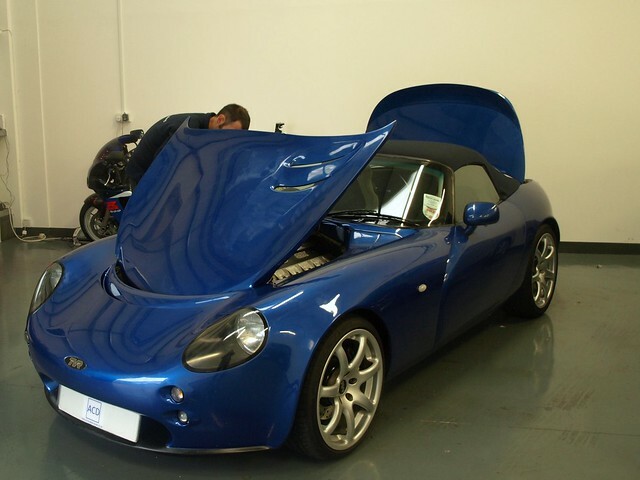 With the car running badly it seemed too risky to drive it home so I called Jason at TVR Power to discuss dropping it off before calling Britannia Rescue to arrange a pickup. I had a short wait at the back of the visitors car park, before an impressive low-loader came to collect me. Sufficiently low that the TVR could drive on (it was running enough to drive on). The transporter was from Guise Motors, and I had a very good chap with the chap (who had worked there for 35 years) about many aspects of car recovery on the way to Coventry. It was an impressively long arrangement with the load bed out. 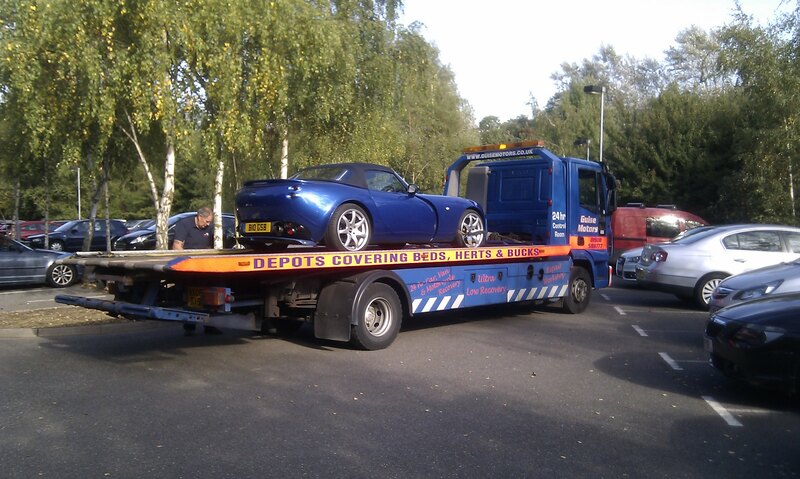 The trip to TVR Power was fine, and after chatting with Jason I offloaded the car into TVR Power’s car park. It was still running ok at idle and slowly, but based on some of the driving around Millbrook towards the end, I think a motorway journey would have been a bad / terminal idea. This was 4pm, and I could get a lift home if I could get to Birmingham International for 5pm. An opportunity presented itself when their cleaner arrived to drop some things off and, with a little fuel money, a lift to Coventry station was provided. A quick train journey linked me up with a relaxing lift home in an XC90. The car has been a dissapointment. I thought the brakes were fixed. 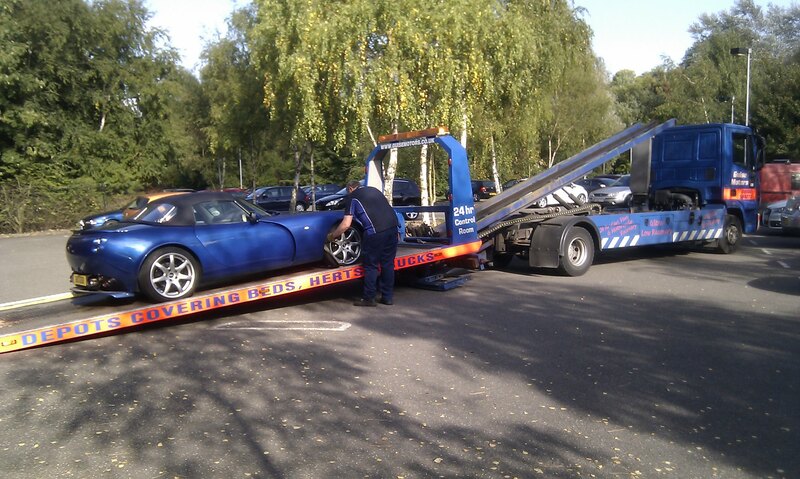 I thought after the money spent on the car and a recent 12k service that I wouldn’t have problems. On the plus side, the suspension work by Neil Garner seems to have paid off and the car is handling well. Even if stopping isn’t quite right and accelerating is now an issue. CAT driver training have been great. Their offers to keep shifting the training are embarrassingly generous and I hope to take them up on it and put more business their way in future. 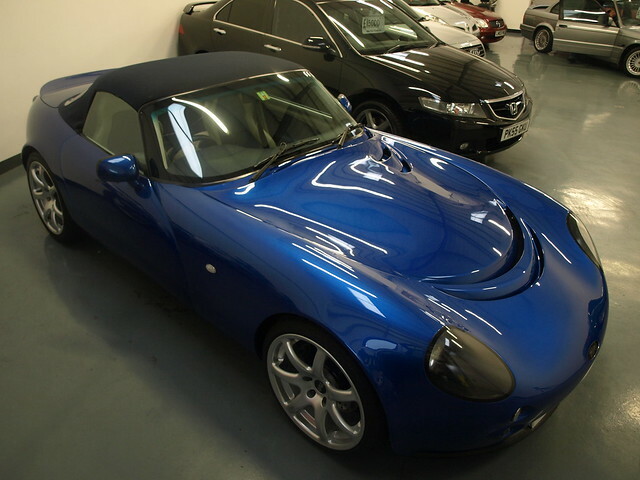 The TVR is re-insured with Manning UK, who do special policies for TVRs. 2011/2012 = 5000 miles, which we used all of. 2013/2014 = 2000 miles, we shall see what we actually use. Fully comp, legal cover, protected no claims for £290 seems good to me. Having had some work done in the services I added notes of the suspension, brakes and exhaust to the policy which made no difference to the premium. Very happy with that. Thankfully I have not had to make any claims, but Manning seem very good in my dealings so far. We discussed agreed value, which we could done at no charge, but I think there is enough of a market in Tamoras to know what a good condition low-mileage original car would go for so don’t see the point. Hopefully we will get to make use of the free Trackday Cover, but not sure we will use much of the 45 days international cover included. A day of free car detailing! Back in August I responded to a post on the Cotswold 3 Counties TVR Facebook page where Richard of Autocar Detailing was offering a free Enhancement Detail (worth £220), in return for use of photos of the photos and help with some text for an article in Sprint magazine. I responded to this, and was pleased to hear that my car had been selected. As Richard was doing this for free, I was happy to do it on a day and in a place that suited him, so on a cloudy Tuesday I left home at 06:00 to travel the 80 miles to Shrewsbury. Leaving at that time thankfully avoids the awful traffic around Worcester and the M5/M6 junction wasn’t too bad either. After stopping for an expensive tank of V-Power Nitro just off Jn4 of the M54 I arrived too early (07:40) and spent some time in the Screwfix car park waiting for Richard who was leaving home. Richard arrived shortly after and we set off the the unit he uses when working from Shrewsbury, which is part of the Hawkstone Cars premesis, run by a helpful chap called Neil. The cleaning started with snow foam to lift the dirt off followed by a rinse with a low-pressure washer to remove the snow foam. The wash followed, using a lambswool mitt and the ‘two bucket’ approach (one to wash, the other to rinse the mitt), and with ‘grit guards’ in the buckets to help avoid the mitt picking up any grit off the bottom of the bucket. A straight back and forth motion was used to reduce the risk of any swirly marks. Drying was by a microfibre towel (reduced risk of scratching compared to a chamois leather if any contaminants remain). Wheel cleaning followed with some special wheel brushes (I need these) and a non-acidic cleaner. The car was then ready to head inside (after I had taken it round the block to dry the brakes off). It was strange watching someone clean my car for me. This is something I have been doing for decades now and it didn’t feel right. But Richard was happy to explain what he was doing and I learned a lot of useful things. 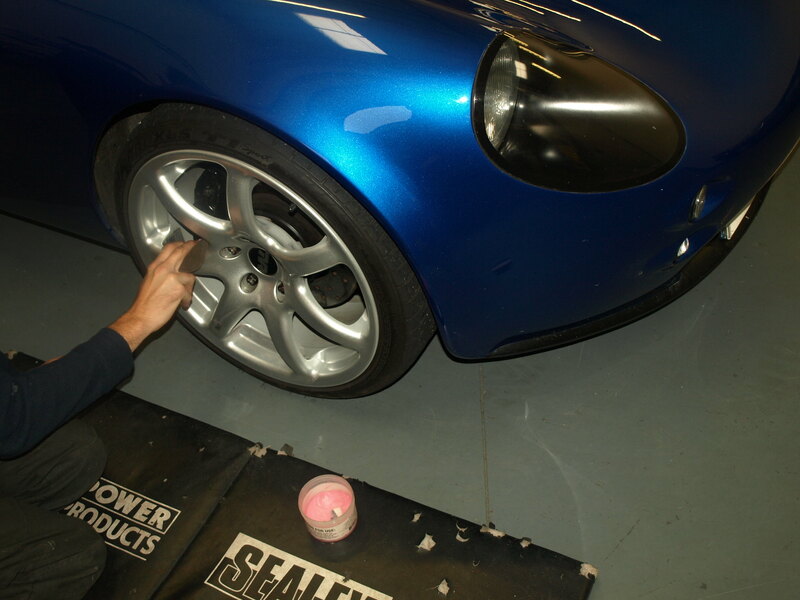 With the car moved inside the workshop, a clay bar and some lubricating spray was used to lift any remaining contamination on the surface before polishing could start. Richard thought the paintwork was in pretty good condition overall with some slight swirling marks that he thought he could polish out. Perhaps he should have chosen a more challenging car, but that would come under the ‘correction’ side of detailing and be a lot more work than the 1 day we had. Having seen some of the polishing done, Richard said the rest of the polishing was a bit I could probably miss, so he gave me a lift into town (plenty to see / do / eat in Shrewsbury), including Creative Audio, my favourite home cinema / Hi-Fi shop, before picking me up 3 hours later. By 14:30, Richard had polished all the panels, and had done 3 of the 4 wheels with a sealing wax to help them repel brake dust. With that done, it was time for 2 coats of hand-applied hard Carnauba wax with some drying time between. Richard also worked round the doors, boot, bonnet and around the small front / rear lights with a quick wax solution. Cleaning the parts others may not. The glass was done next. Cleaning was followed by the application of something special to the windscreen which helps water bead off it (and seemed to work on the drive home). With that done, the car was ready. There are still the few paint chips on the nose and a couple of deeper marks, but overall it is very pleasing. You have to look closely to see any imperfections and the panels have a deep shine to them. This was 8.5 hours work by Richard without really taking a break. And that is for a fairly small car. A lot of effort goes into the Enhancement Detail, and it seems to be something that is worth doing when a car could benefit from that level of attention. With this work done, there should be no need for me to wax the car for ~ 6 months (perhaps longer given its easy life in the garage). And there should be no need to polish it for a long time. Hopefully with some of what I have learned about washing the car I can minimise the chance of it getting any new scratches / marks. With the Enhancement Detail done, future cleaning could be done by myself, and perhaps making use of the Maintenance Detailing if required. Sadly it was raining outside. This gave a chance for it to demonstrate some good beading with rain water and thankfully the rain stopped after 5 minutes and I had a dry drive the rest of the way home. Traffic round Worcester was awful though, I am glad I don’t have to do that every day. Many thanks to Richard for his hard work during the day, and hopefully the future Sprint article will be useful to readers. It is nearly time for our Performance Driving day with CAT Driver Training. This covers 5 skills (braking, high speed, under/oversteer, cornering and the Alipne circuit) and we are both doing it swapping in/out through the day. Hopefully all the work done on the car will pay off after the last attempt. CAT have been very good with letting us rearrange over this lengthy timescale.